/Design Tools - Backgrounds /Can I make the background color match a blue dress from my photo? Yes, you can make the background match a color that appears on your design or photo. Learn how it’s done below. Locate the “Backgrounds” tab on the left side of the Design Center — it’s the second panel down. 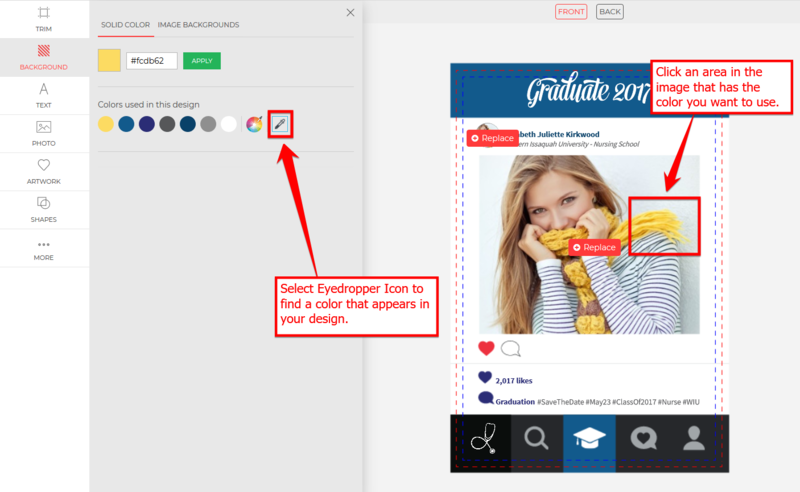 Click the eyedropper icon located next to the list of colors used in the design. Your cursor will become the eyedropper icon. Place your cursor over the color in the photo that you’d like to use. For the above example, we are borrowing the yellow from the grad’s scarf. The Design Center will register the yellow and you can now use it as a background color.